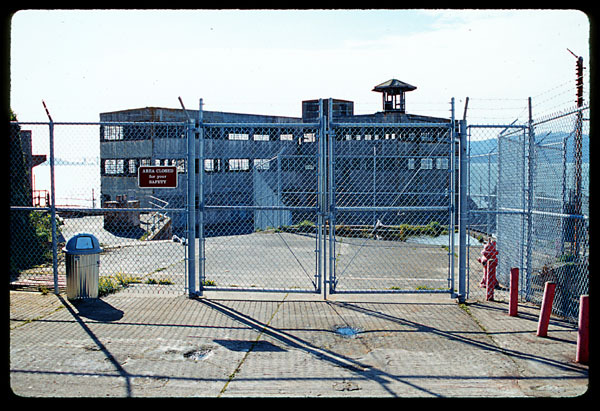 As long as I can remember, I've been fascinated by Alcatraz. The Rock is a place of legend, a place where some of our country's worst criminals spent their lives, tortured by their solitude and their proximity to the free world. It's unbelievable that such a place could exist so close to San Francisco, just over a mile from Fisherman's Wharf. 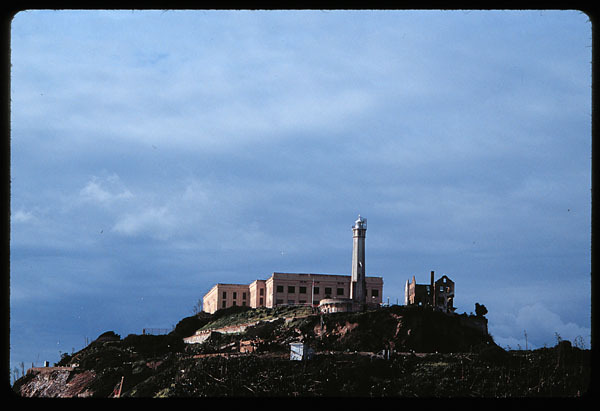 Alcatraz is, of course, most famous for being a federal penitentiary, but it wasn't always so. 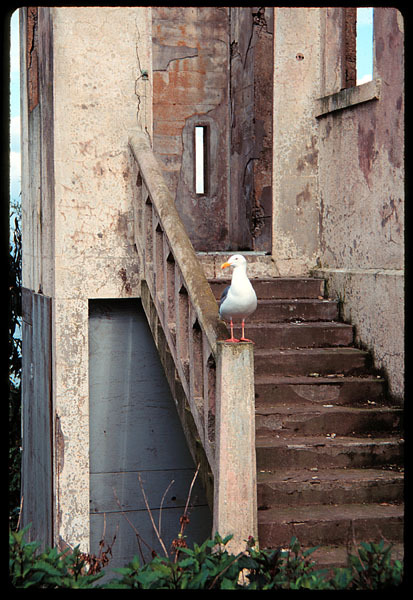 It was a uninhabited island until the mid-nineteenth century, known as "Isla de los Alcatraces" after the birds spotted on the rocky surface. 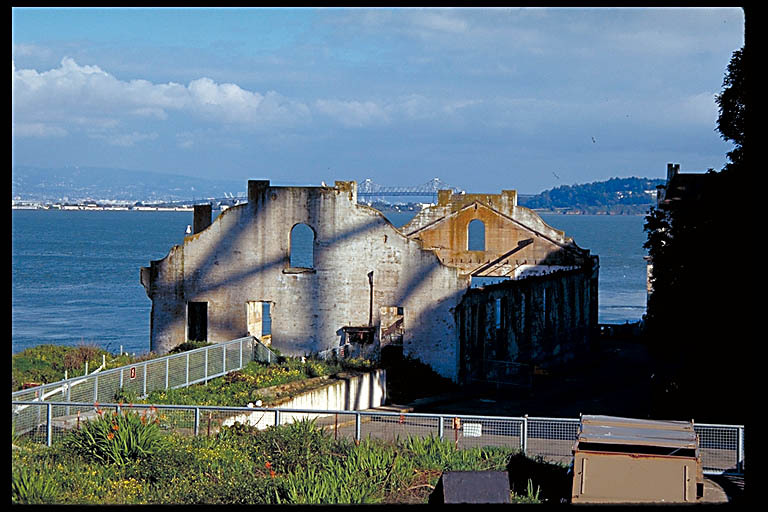 After California became a state in 1848, a fort was constructed on Alcatraz, as part of a plan to defend the harbor. It never saw a battle, however, and by the turn of the century the last cannon was removed. 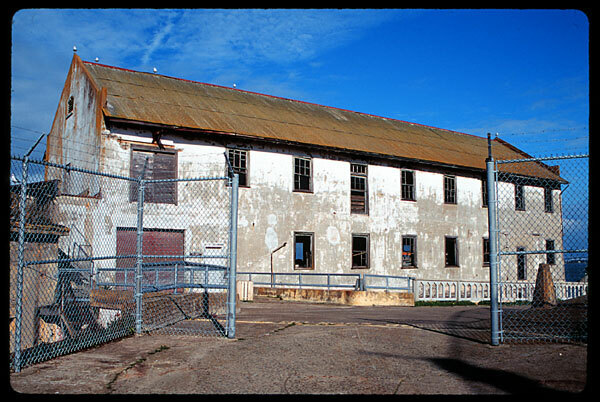 The island was more successful as a military prison, reaching its peak during the Spanish-American War, when almost 450 prisoners from the Philippines were housed on the island. 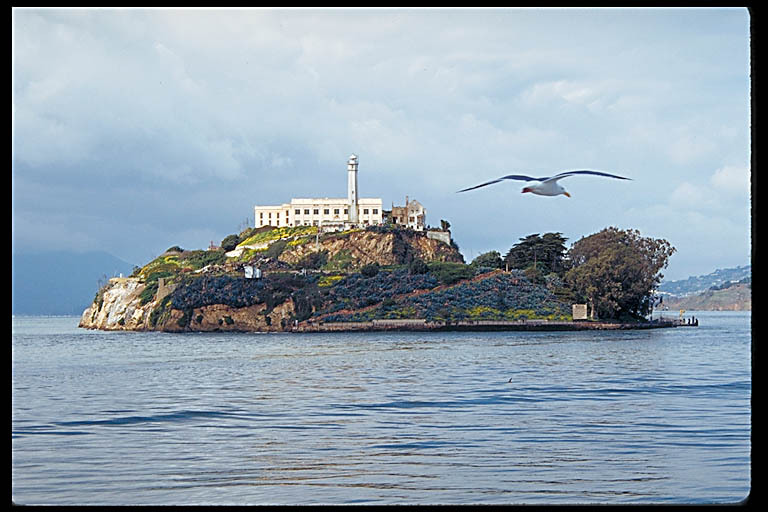 In 1933, the U.S. Army transferred control of Alcatraz island to the newly-created Federal Bureau of Prisons. 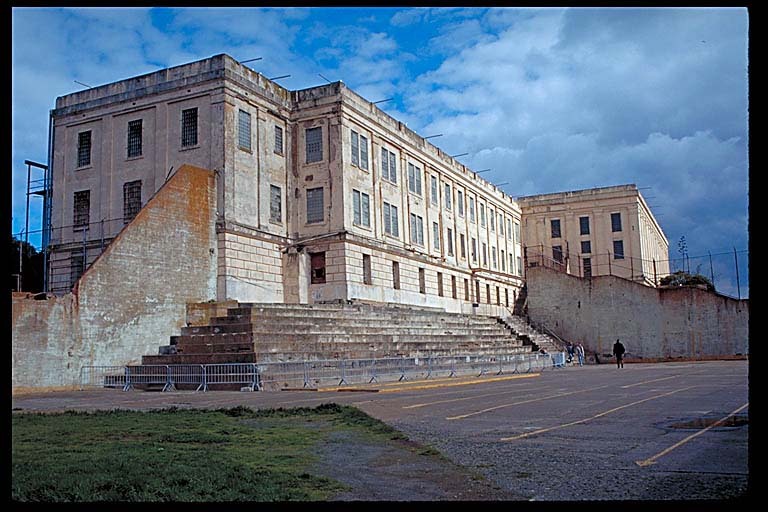 Alcatraz was to become a maximum-security, minimum-privilege facility for the worst criminals in the nation. 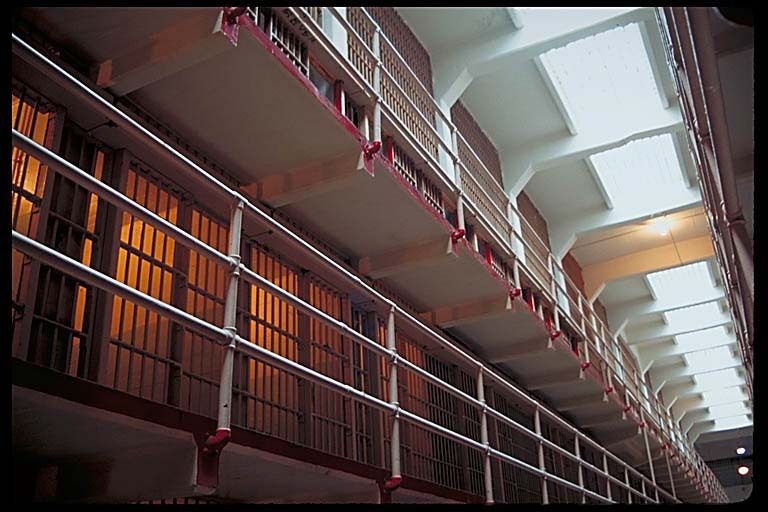 It's most famous inmate was Al Capone, who spent over four years on the island before being transferred elsewhere. 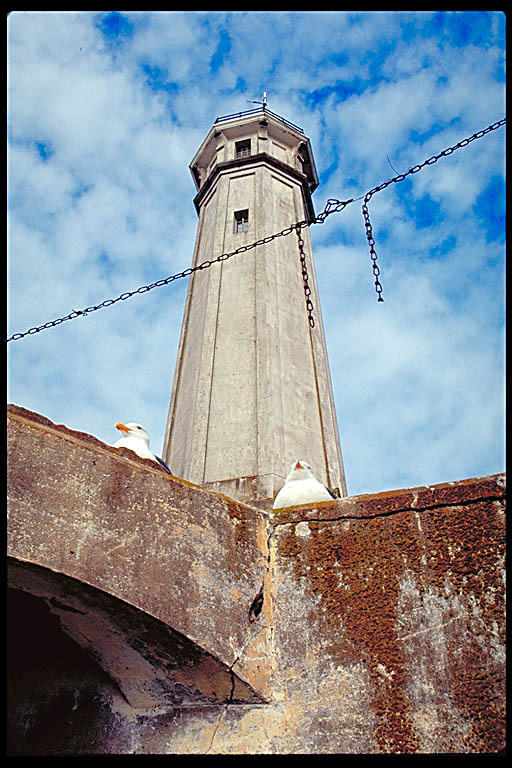 Other notorious residents included George "Machine Gun" Kelly and Robert Stroud, the "Birdman of Alcatraz". The nickname is a little misleading; he was kept in solitary confinement for seventeen years and was never allowed to keep birds at Alcatraz. 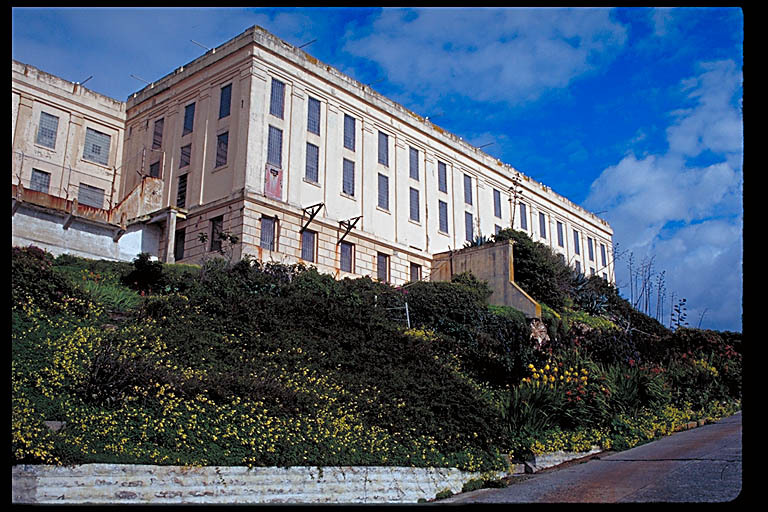 As a prison, Alcatraz never reached capacity, averaging less than 300 inmates at a time. There was at least one guard for every three prisoners. Despite the close supervision, however, as well as the icy, shark-infested bay surrounding the island, there were 14 attempted escapes from the Rock. None were known to be successful, although the bodies of Frank Lee Morris and the Anglin brothers, Clarence and John, were never found. 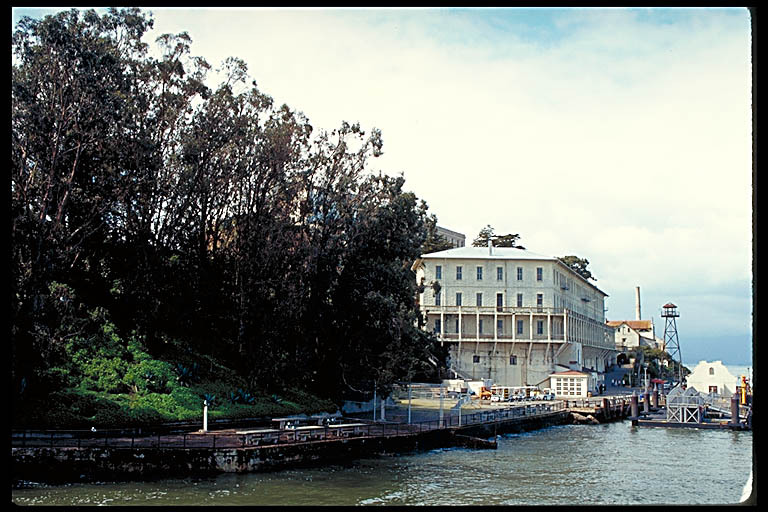 Their 1962 attempt was the source of perhaps the most famous Alcatraz movie, Clint Eastwood's Escape from Alcatraz. 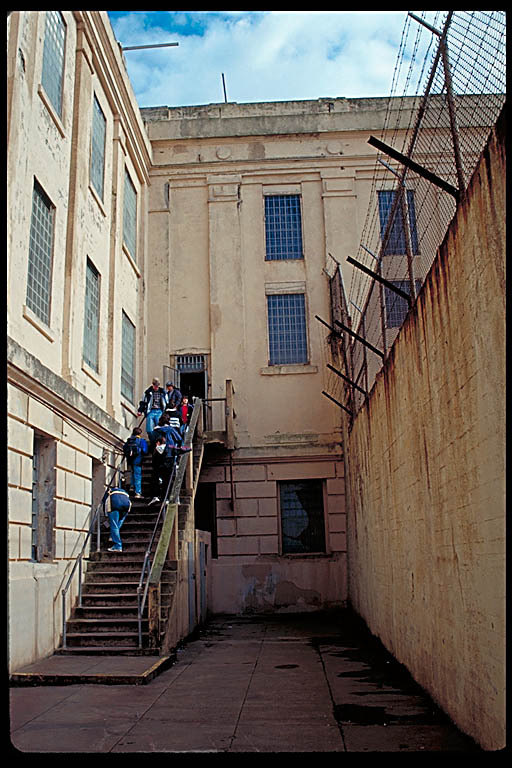 The escape attempts, along with the expense of maintaining a deteriorating facility, forced the prison to close less than thirty years after it had opened. In 1961, U.S. Attorney General Robert Kennedy announced the eventual closure, and in 1963 the last inmates left the island. 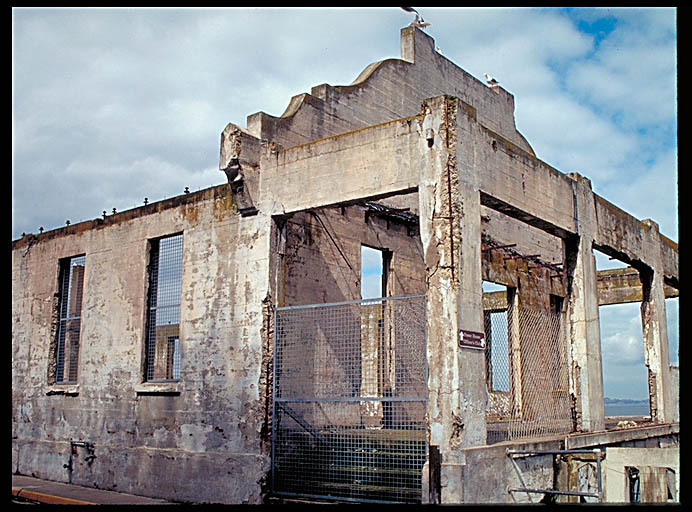 Alcatraz lay vacant until 1969, despite numerous development proposals, when the next chapter in its history would begin. 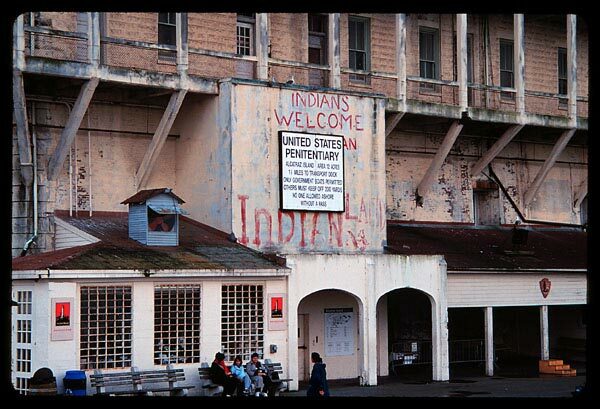 In November of that year, Alcatraz was occupied by 89 Native Americans, and claimed as Indian land. The occupation was meant to call national attention to the plight of Native Americans, although there was little financial or political support for their cause. It lasted until June 1971, when U.S. Marshals removed the few remaining protesters. At that point, many of the existing residential buildings had to be razed, due to deterioration from weather, fire, and vandalism. 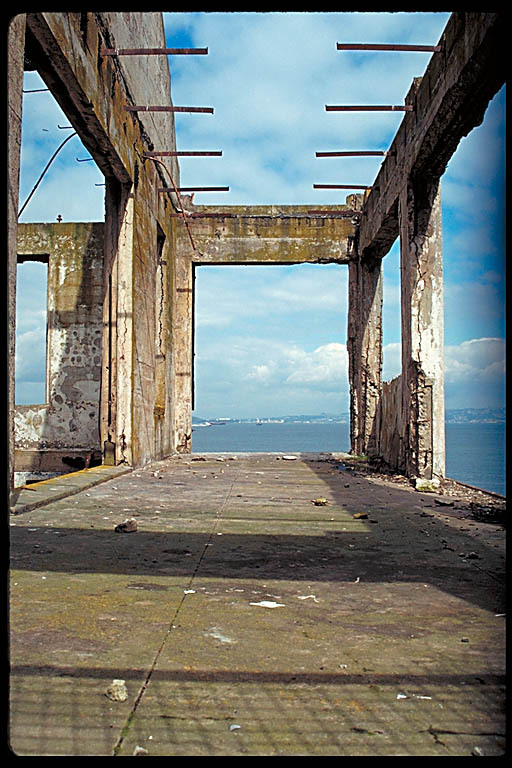 The destruction of some of the buildings did bring attention back to Alcatraz, and the public began to look for new ways to save the island and its history from being lost. 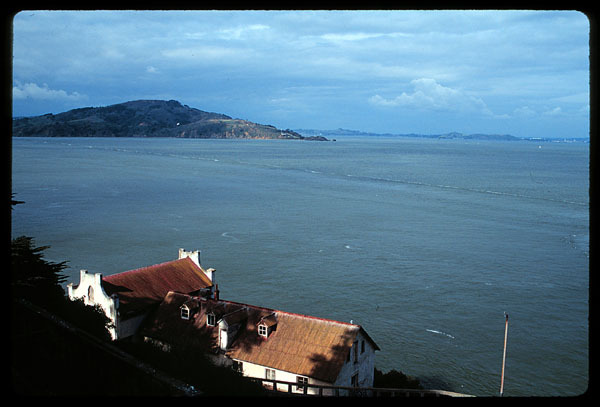 In October 1972, Alcatraz became part of the Golden Gate National Recreation Area, run by the National Park Service. 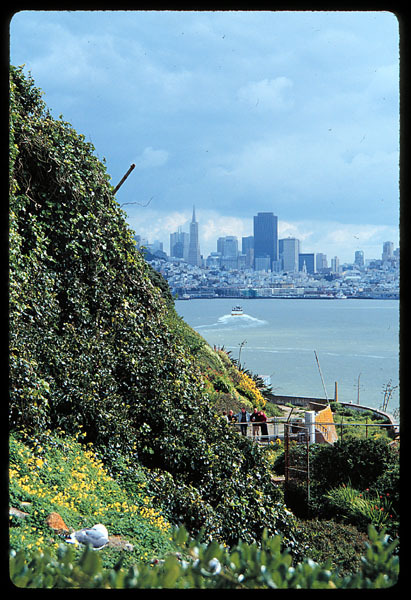 The island has been open for tours since 1973, and is one of San Francisco's more popular and best-run tourist destinations. You get to Alcatraz these days by booking a spot on the Blue and Gold Fleet ferry, and it's a good idea to buy your ticket in advance. I got there soon after the ticket office opened, at 9:30 on a cloudy Monday morning in March, and the first available tickets were for 12:15. Alcatraz is one of the best deals in San Francisco, if you ask me. It costs only $12.50, including the cost of the audio guided tour of the cellhouse once you're there. Park Rangers also offer free tours of the island itself, or at least the areas that are open to the public. As you approach the island, you get a fantastic view of the lighthouse, as well as the ruins of the warden's house, destroyed by fire during the Indian Occupation. The wharf is on the eastern side of the island, where it has been since 1854, although rebuilt and enlarged many times in that period. 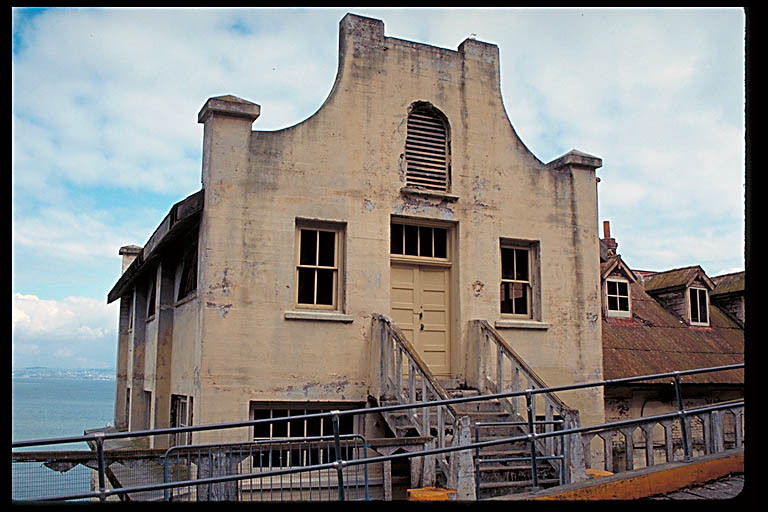 The large building that dominates the wharf dates back to 1865, when the lower level was built to house both soldiers and cannons. The three stories of apartments were built above it in 1905, to house more soldiers. 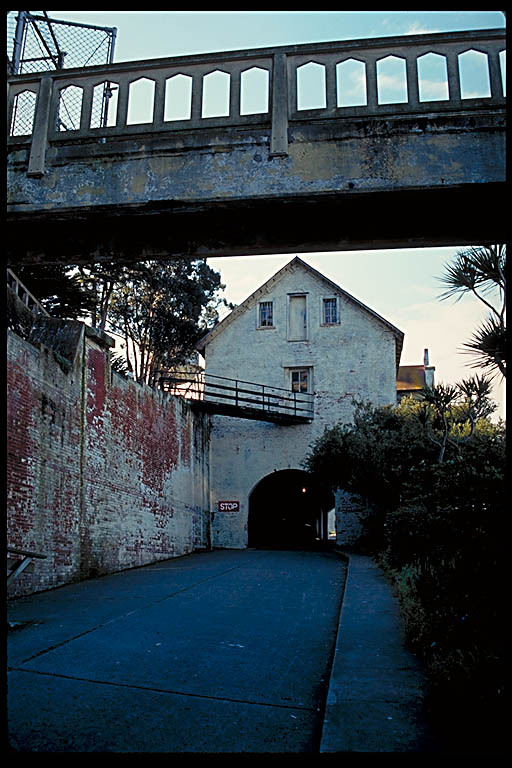 Heading up the eastern side of the island, the first building you encounter after the barracks is the guardhouse, with its "sally port", or armed gate. 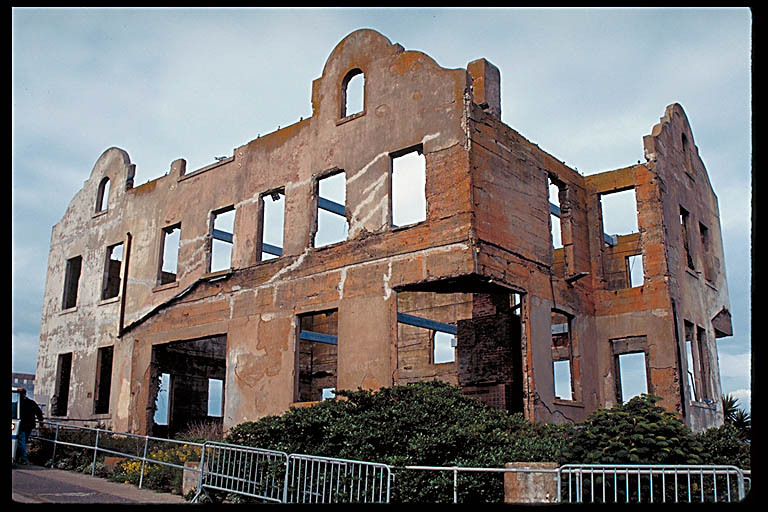 It's the oldest standing building on Alcatraz, dating from 1857. In the 1920s, a military chapel was built above it, a two-story addition built in what a Park Ranger affectionately described as the "Taco Bell" style. It was only a chapel for a about a decade, however, as it was converted fully to apartments when the Federal Bureau of Prisons took over the island. Continuing up the slight incline, you soon pass the ruins of the post exchange/officer's club, built in 1910 and, like the warden's house, destroyed by fire in 1970. Originally used as a market building, the post exchange sold food and other goods to soldiers. 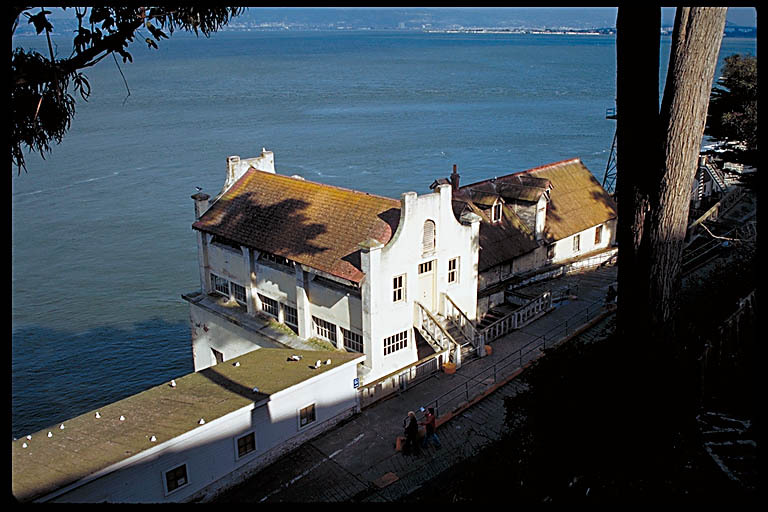 It was later converted to a club for the island's correctional officers and their families. 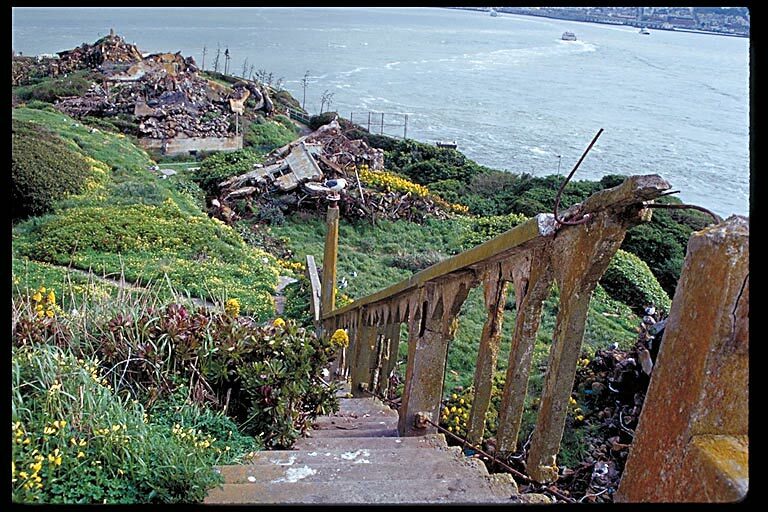 As you zig-zag your way up the eastern slope, you pass close to the abandoned buildings in the rear of the island, not currently open to the public. Buildings here include the bakery, a power plant, and the industry buildings where prisoners who earned the privilege were allowed to work. 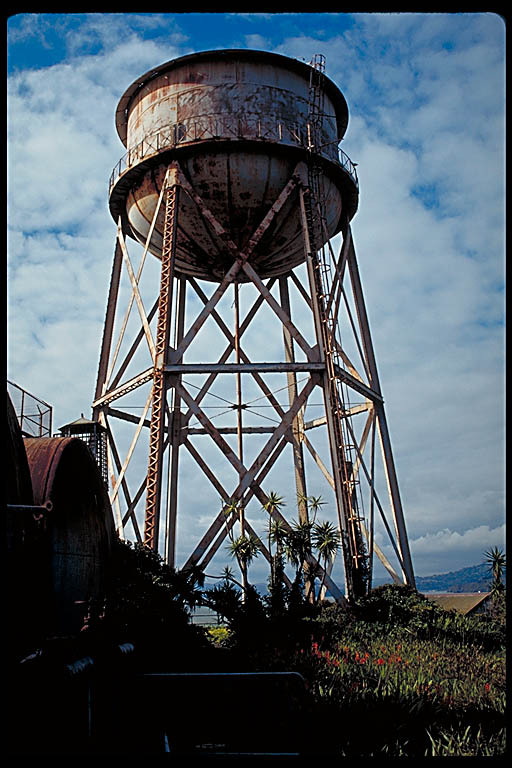 The water tower sits next to the morgue, which runs in a tunnel underneath the recreation yard. The park rangers are quick to point out that the morgue tunnel is the only tunnel on the island, despite what you may have seen in The Rock, the recent movie with Nicholas Cage and Sean Connery. 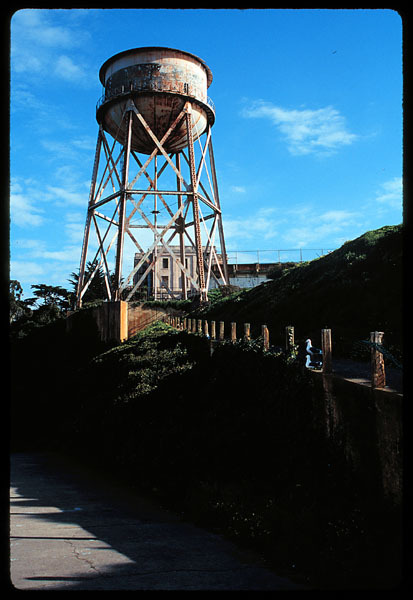 At the top of the hill lies the cellhouse, the massive centerpiece of Alcatraz and the symbol of its role in the twentieth century. 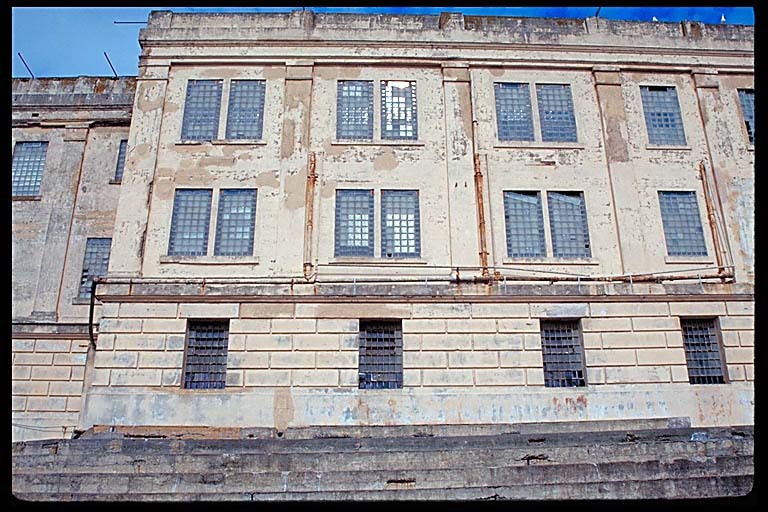 The cellhouse was completed in 1912, after Alcatraz became a full-time military prison, and renovated in 1934 when Alcatraz became a federal prison. 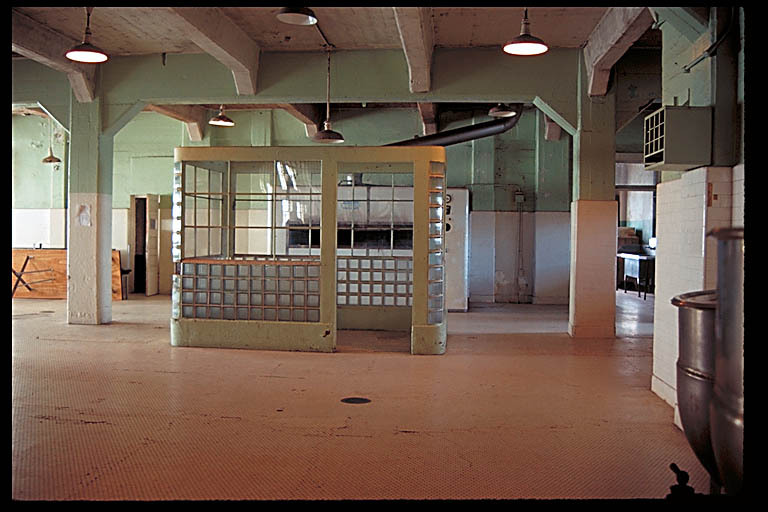 I've never been a huge fan of audio tours, preferring to make my own way through exhibits and galleries, but I can highly recommend the National Park Service's audio tour of the Alcatraz cellhouse. 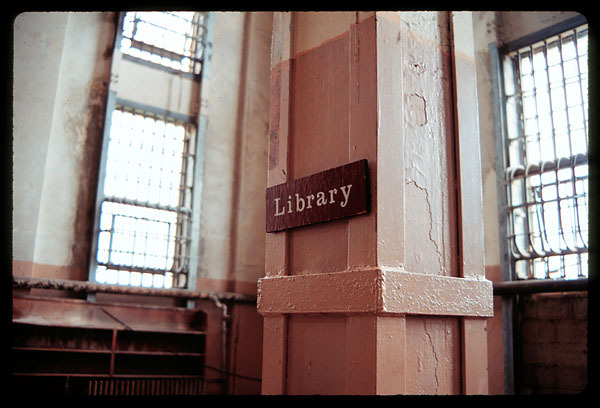 It's a 45-minute tour, with narration by former inmates and guards, and as it walks you through the corridors, cells, and rooms, it's as if the building itself is alive with its own history. 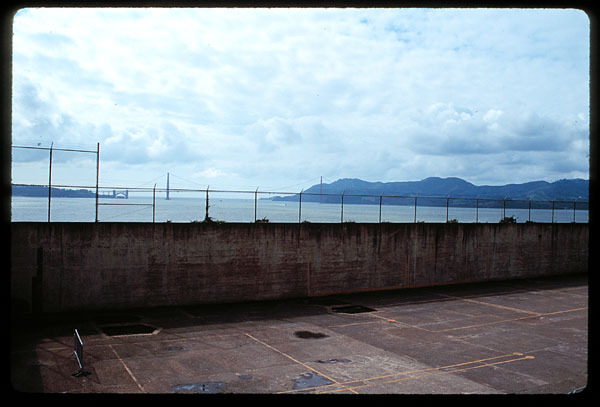 Staring out the window of the dining hall, looking at the Golden Gate Bridge, you can see for yourself how close these prisoners were to the "real world", and how frustrating their isolation from it must have been. Apparently, on New Year's Eve, the wind would carry sounds from parties in the city to the Rock, tantalizing its prisoners with bits and pieces of life on the outside. 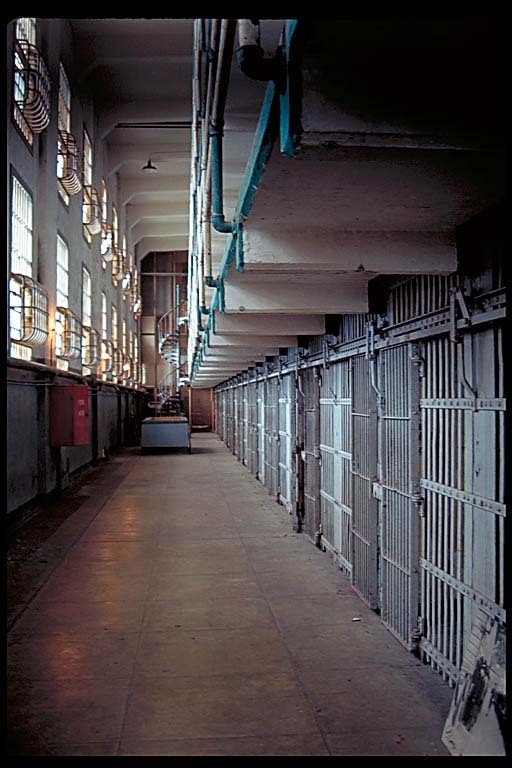 Walking through the cellhouse, I was able to see the cells in which Morris and the Anglin brothers carved their escape routes, complete with the masks they placed in their beds to fool the guards during nightly security checks. A glass wall allows visitors to see exactly where they climbed through the pipes and up to the roof. I was able to walk inside a cell and experience just how confining a prisoner's living space really was. 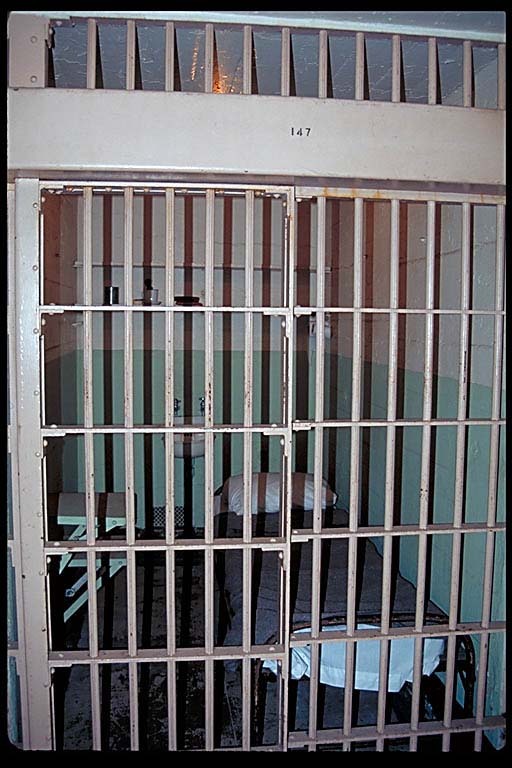 Standing in a cell in "D" block, known as "the hole", I listened to the voice of a prisoner describing the desperation he felt in the complete darkness, denied both light and human contact for days, weeks, or even months. The cellhouse consists of four cellblocks, none of which sit against an exterior wall. 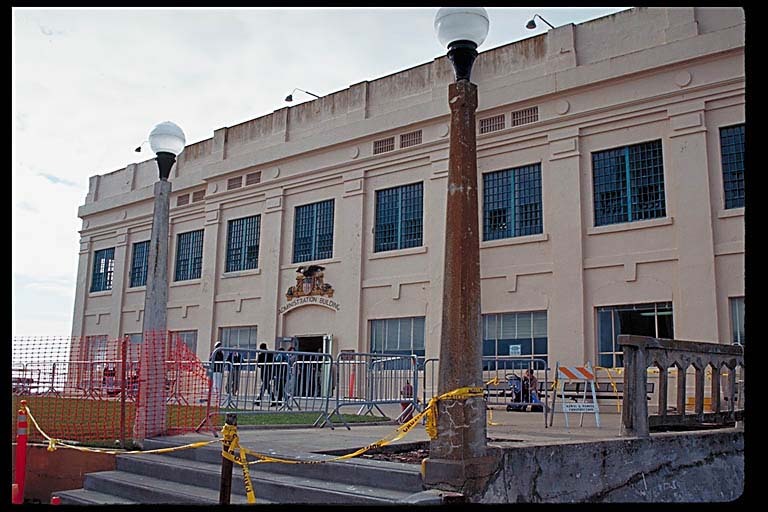 During the 1934 renovation, three of the four blocks were retrofitted with flattened, hardened steel bars and automatic locking devices, representing the latest in high-security technology. Only the "A" block retained the old iron bars and key locks, and it was therefore rarely used to contain prisoners. Directly in front of the cellhouse, visible from the mainland, is the lighthouse. 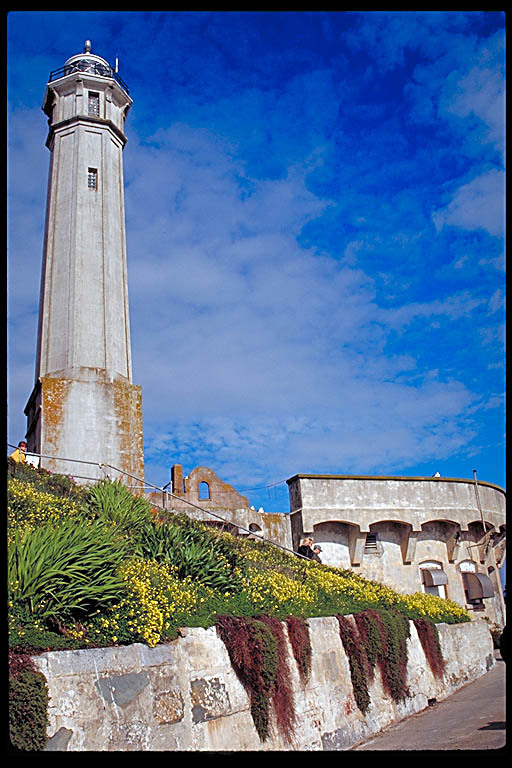 The original lighthouse was built in 1854; it was replaced in 1909 by this 84-foot tower, now automated. If you've seen The Rock, by the way, you may remember a fantastic explosion at the end, in which a lighthouse was the key component. 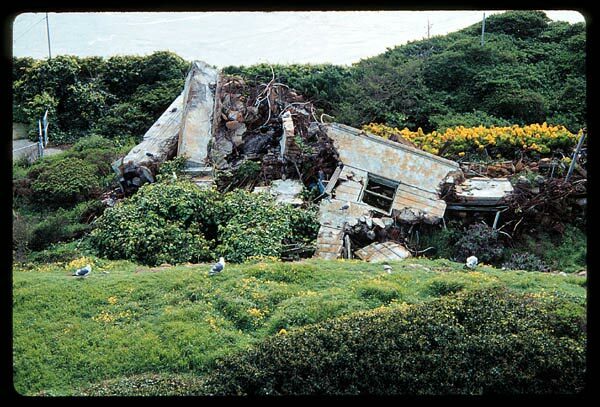 That was a second lighthouse constructed (and destructed) especially for the movie. There was actually a great deal of location shooting for The Rock, but none of it was allowed to interfere with public access to the national park. Filming was done only during periods when the island was normally closed, or in locations that are normally closed to the public, like those at the rear of the island. Also closed to the public are the areas of the island that contain ruins of former residences. 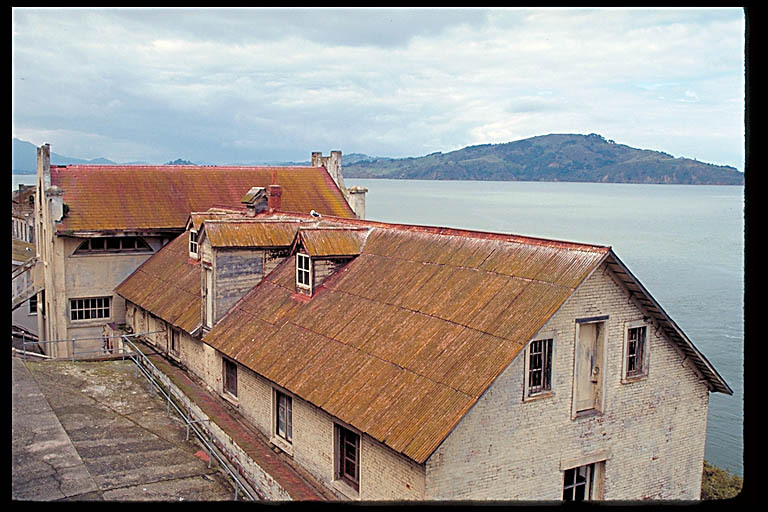 Along the eastern side of the island, lining the hill next to the cellhouse, stood a group of officer's quarters. These beautiful Victorian houses were torn down in the 1940s, but the brick basements remain, overgrown but recognizable. Another closed area is the parade ground directly at the front of the island, which was carved out in the 1870's. 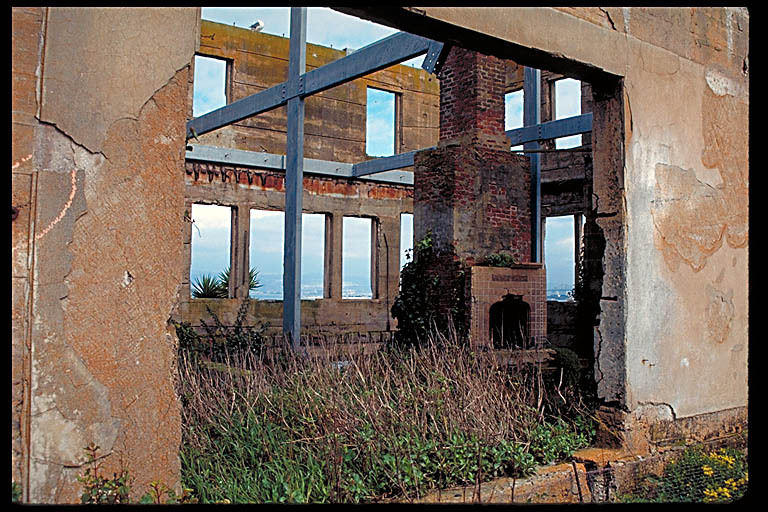 More officer's quarters were built along the edge, and later, families of the guards who served on the island lived in apartments there. 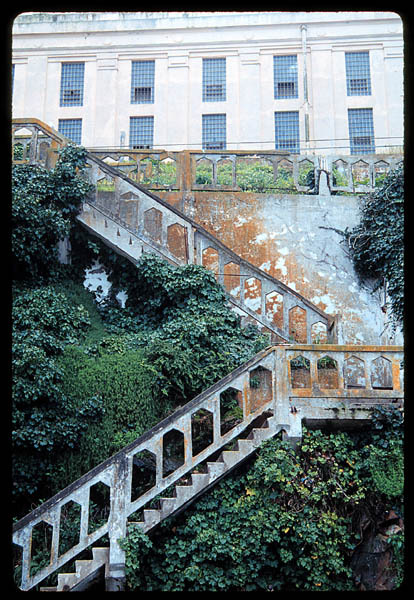 I had never given any thought to the fact that civilians would live on Alcatraz as well as prisoners, but it adds a whole new sense of depth to the island's history. 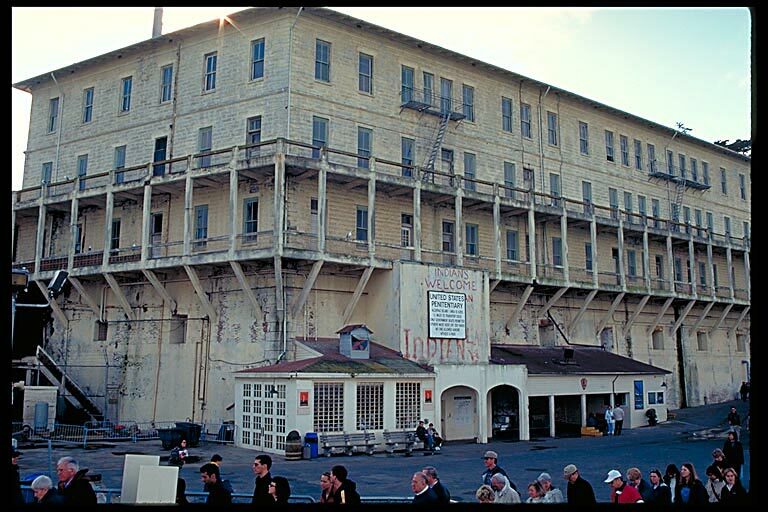 In fact, when I was visiting, a woman who had spent nine years on the island as a child was signing copies of her new book, a history of Alcatraz as told through interviews with former inmates and officers. 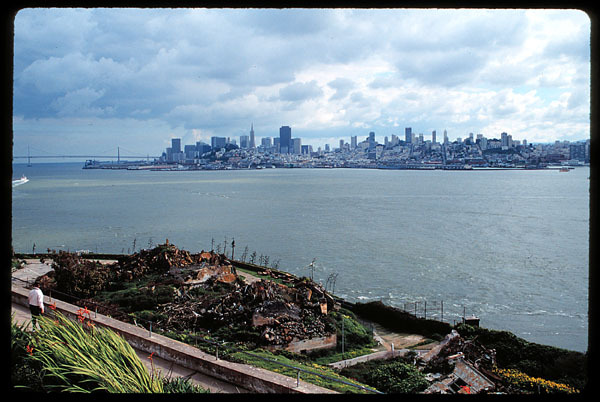 While the apartments on the parade ground were razed in 1971, the rubble was never removed. Their broken remains sit like ancient monuments along the edge of the island, giving the place an eerie sense of age and desperation. Likewise, the warden's house, sitting majestically at the top of the hill, is now a empty shell of a building. The bare concrete walls look strong, yet they have to be supported by steel beams to keep them from collapsing. The grass growing inside the walls and the birds who have made this structure home help create an image of nature slowly reclaiming space that was stolen from it years ago. 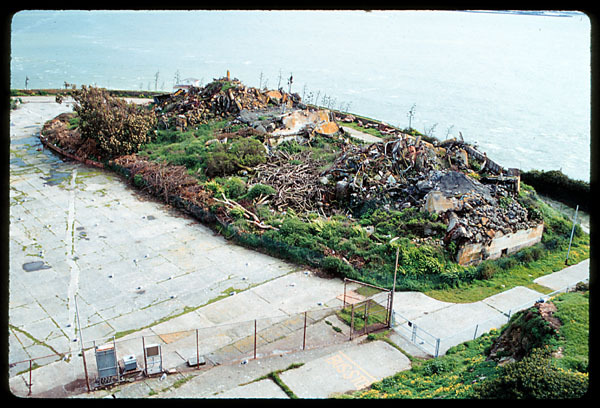 Ironically, it was humankind that introduced nature to Alcatraz. 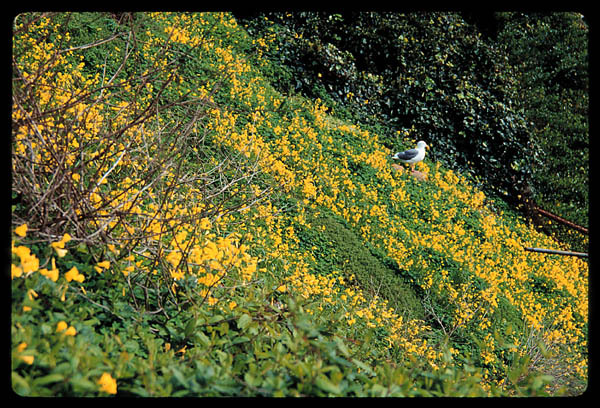 While birds had made the island home long before we did, the surface was too barren and rocky to support plant life. 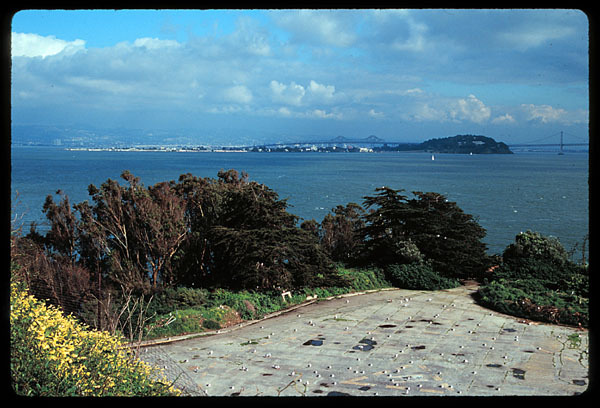 Topsoil had to be imported from nearby Angel Island so that officers and their familes could maintain even small gardens. 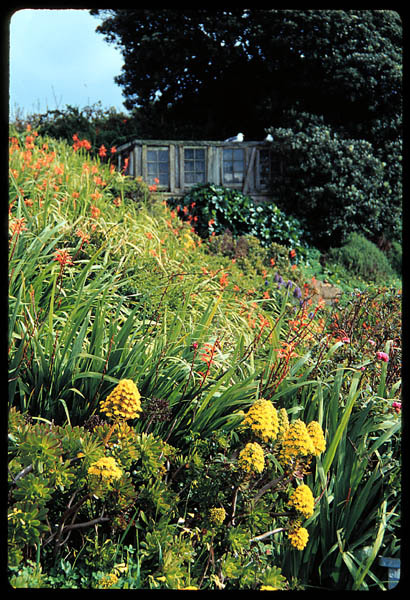 A gardening association was formed in 1924, and with the help of military prisoners, most of the trees, shrubs, and flowers that exist today were introduced. 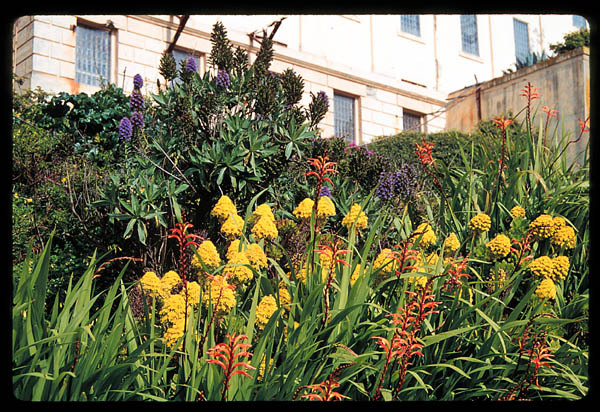 Today, Alcatraz is rich with greenery and color, and the National Park Service is working hard to ensure that the natural beauty remains. 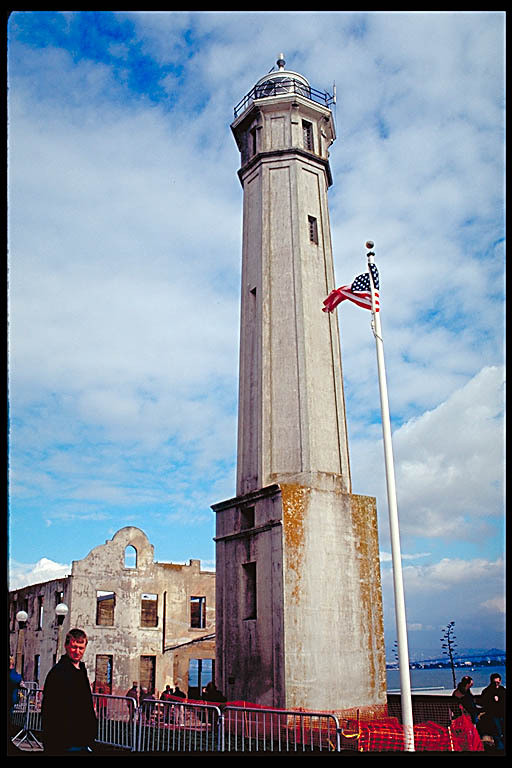 For more information about Alcatraz, be sure to visit the National Park Service's Alcatraz web site.